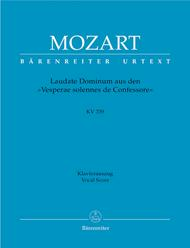 Laudate Dominum, KV 339 composed by Wolfgang Amadeus Mozart (1756-1791). Edited by Karl Gustav Fellerer; Felix Schroeder. Arranged by Martin Focke. For soprano voice solo, SATB choir, and piano reduction. This edition: Stapled, Urtext edition. Stapled. From the Vesperae solennes de Confessore. Level 3. Vocal score. KV 339. Published by Baerenreiter Verlag (BA.BA5339-90).ISBN 9790006527465. 27 x 19 cm inches.Full instrumentation: soprano voice solo/SATB choir/bassoon/strings/organ.